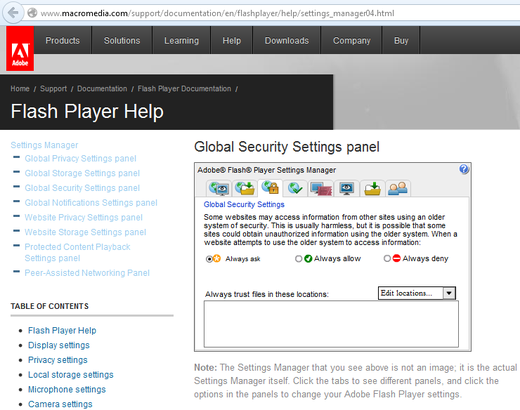 When using the Flashplayer locally / offline, then the External Interface of the Flashplayer is disabled for security reasons by default. When using the Flashplayer 'online', that means when running the Flashplayer on a 'http://' address (can be also a 'localhost' server), then the External Interface is always available. For the krpano Mousewheel/Page-scrolling fixes (very important for Mac). When trying to open urls, e.g. by the krpano xml openurl(url) action. When loading data or code from the web, e.g. the Google Maps Plugin or the Bing Maps Plugin need this to be able to load the map tiles. Additionally it's possible to check interactively if the interface is available via the haveexternalinterface variable. Chrome Browser Note - the integrated Flashplayer of the Chrome Browser currently has a bug and ignores all custom Flash Player Security Settings! There it would be necessary either to disable the integrated Flashplayer (by using this url - chrome://plugins - click on 'Details' and deactivate the 'PPAPI' Flashplayer), or to use a localhost server for local testing. Note - using the link from above to change the settings is highly recommended! 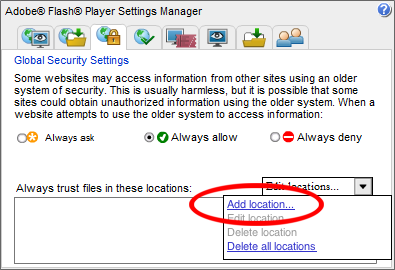 Newer Flashplayer versions are allowing to edit the trusted folders also from the right-click 'Global Settings' menu, but in some Browsers this is partially buggy and the settings will be not applied correctly. 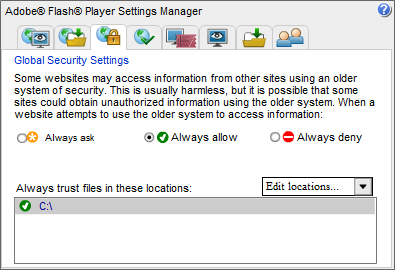 Therefore always use the Online Flashplayer Settings Manager to change the settings! 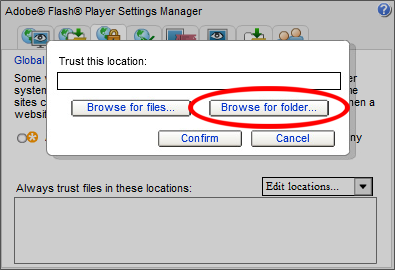 Select Browse for folders... and look for the folder which contains the Flash .swf file and select that folder, then click Confirm. Note - Selecting a higher-level folder or the root folder itself is possible too, all sub-folders will be automatically trusted too! 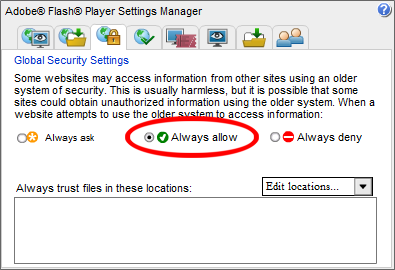 Verify if the folder was added correctly and the 'green check' is still shown at the 'Always allow' option and at the added folder. To apply the settings, just reload the settings page. Note - the some browsers need to be restarted before the changed settings will work!